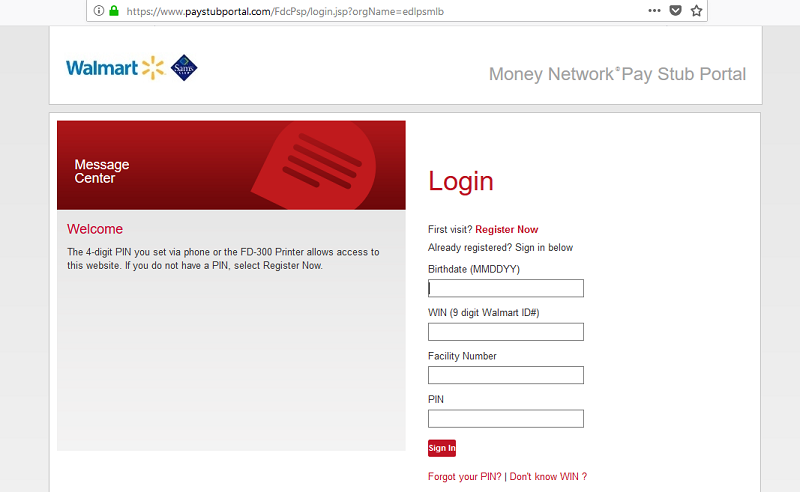 Money Network Walmart Paystub Portal. Check your Walmart paystubs online, by accessing the Money Network Walmart Pay Stub Portal. Login and check your Walmart paystubs/paychecks online, from your mobile phone or from your home computer. Note: To access the Money Network Walmart Prepaid Card, go to www.walmart.everywherepaycard.com. You can easily view your Walmart paystubs even when Walmartone is down or you have ne terminated as a Walmart Associate. You can also choose have your paystub emailed or texted to you automatically as soon as it is available. Note: The Walmart Money Network website could usually be found at www.moneynetwork.com, but this page has been terminated, and you will now need to go to www.paystubportal.com or www.exceedcard.com instead. Terminated Walmart Associates Paystub Instructions. Your WIN Number (If you don’t know your WIN, select “Don’t know WIN?” at the bottom of the page and enter the Hire Date instead of the WIN). Create a 4-digit PIN number. This PIN number must be numerical – no special characters are allowed. Choose Sign-In Now and re-enter the log-in information in order to check your previous paystubs. Enter your Birthdate, WIN (9 digit Walmart ID#), Facility Number and PIN, to log in to the Paystub Portal. The Walmart Paystub Portal shows both the upcoming check (if you are a current employee) and previous checks, just later than the paystubs that you can access via WalmartOne.com. The Paystub Portal updates on the Monday before your paycheck. Current employees can also view their paystubs on the WalmartOne platform and with the WM1 app. You will need to register an account first to use the Walmart Paystub Portal. If you have problems, then please state your issue below. 1 Money Network Walmart Paystub Portal. 2 Walmart Paystub Portal Login. 3 Terminated Walmart Associates Paystub Instructions. 4 Walmart Paystub Portal Registration. I am trying to get my current pay stub?